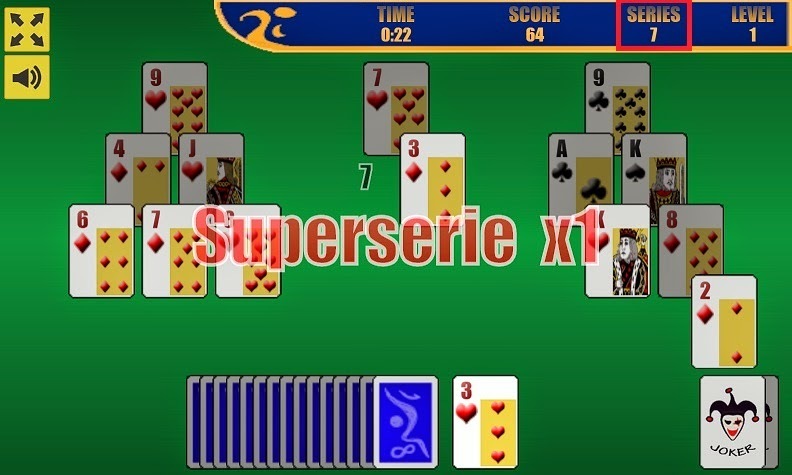 In this first post we will focus on which we believe are the two key aspects, the series and the creation of the maximum number of options to remove each card. Mastering this simple game is often to know how to pass up one for the other. And the great players are those who, at such times, know what option is best. Series are needed to add lots of points to the scoreboard. As long as we do not put a new card from the deck or a joker in game, the series is incremented. Each removed card adds as many points as its position in the series. In addition, the points for each Superseries bonus must be added, bonus given whenever the value of the series is a multiple of 7. If, for example, we remove seven cards one by one, we have 1 point for each card. However, if we can complete a seven cards series, we get 1+2+3+4+5+6+7 points for the cards, and an extra of 25 points for the Superseries. Those are 7 points versus 53. Let us take it a little further. If we complete a fourteen cards series, we are talking of 1+2+3+4+5+6+7+8+9+10+11+12+13+14 points, plus two Superseries, the first one of 25 points and the second one of 50. 180 points versus 14 if we remove those cards one by one!!! These examples illustrate the fact that, to make a score capable of getting into the best, we must maximize the series. On the other hand, when we talk about creating options, we refer to have available as many different card values as possible in the pyramids. We have all played that level in which, without realizing it, have set free three cards, all of them with the same value. In the example shown in the image, we can only use a J or a K from the deck. Unless we get lucky, we are going to have to put in game a lot of cards from the deck, so there will be a few ones to remove the remaining cards in the pyramids. We will probably lose the joker and still get hard to complete this level. And when we get a J or a K, we must remove the left or the middle Q, which give us two options, and never the right card that only gives us one. This is a simple example, but defines what is to create options. When we play, we follow a rule: Unlocking the cards in rows, that is, releasing the cards that are lower in the pyramids, unless it limits our options. And, as mentioned at the beginning, we must choose the right moment to run the risk for a good series. we play this game. 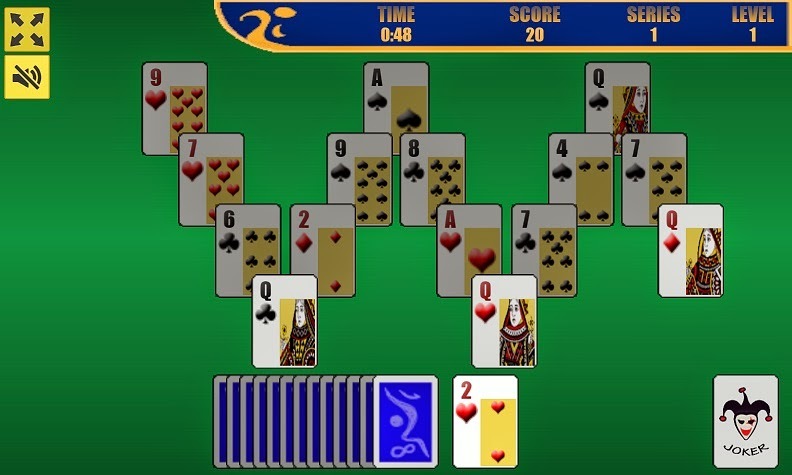 But we hope that this simple analysis will serve you to have clear which, from our point of view, are the two basic concepts to master to become a great Pyramids - Tripeaks Solitaire player. Finally, note that this analysis is perfectly applicable to the face-down version of the game. We leave the differences for another occasion.